Shimla, the capital of Himachal Pradesh, has always been a hot favourite of everyone in summers. No wonder then that the place was used by the Britishers as a summer capital for years together from 1864 till 1939. 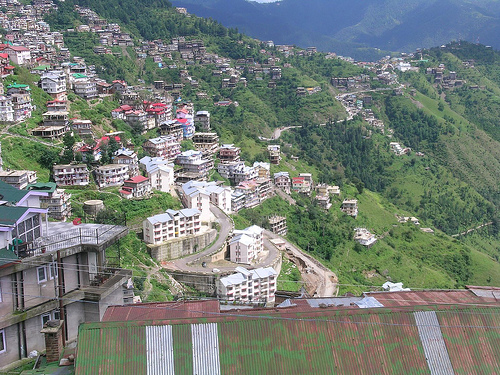 The britishers fondly named Shimla the Queen of hill stations and even today, this small hill station, nestled amidst the pine forests and apple orchids, invites tourists in hordes. What’s more? The city is also so well connected by train; road and air that tourists find the place very approachable even for a short break and the cool environs of the city are always beckoning for all and sundry, especially when the rest of the country is feeling the heat of the rising temperatures. However, it is a different story all together in the peak season when, many a times, the city is so packed to its capacity that the place becomes as chaotic as any growing city of the country. So quite often, the visitors are surprised to see the same chaos, traffic jams and acute water shortage in this renowned hill station. In fact, quite a few times the streets are so jam packed that the authorities have to ban the entry of vehicles in certain parts of the market. Yet despite the chaos, the moment one moves out of the hubbub of city, the surroundings are alluring and soothing. When we spoke to little Anisha on what she liked the most in the place. She seemed awe-stuck by the toy train that takes one from Kalka to Shimla. Passing through almost 105 tunnels, this train cutely chugs through the narrow and specially built rail network that links the hill station with the other parts of the country. On the other hand, the middle-aged Tom- a Britisher was thrilled by almost everything-the smiling faces of people that greet you while one moves slowly up the hill in the toy train. He was equally fascinated by the smooth trek that he had while visiting both the Sankat Mochan and Tara Devi temples. He liked the manner in which complete view of the city could be enjoyed from Sankat Mochan temple and the beautiful hill resort. He did lament the fact that visiting in summer, he couldn't saviour the luxury of enjoying winter sports at Kurfi, which is known as the winter sports capital. Most of the tourists are equally overwhelmed by Jakhu hill, which is at a height of 8000 feet and also happens to be the highest peak in the area. What mesmerises tourists on this hill is the breathtaking view of the snow-capped peaks of Himalayan range. And for many foreigners, the very sight of extremely bold monkeys in and around the Hanuman temple is fairly amusing. They are equally enchanted by the familiarity that these animals have with the human surroundings, and can always be found busy capturing these memorable moments in their cameras.